I don't know about you, but I've started noticing a trend of late. 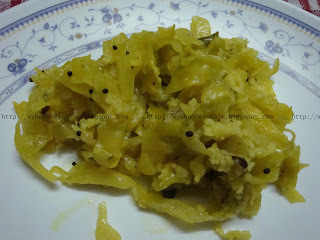 I have been posting quite a few traditional Goan recipes. I can't help it, thats where my roots are and honestly I love the food. I promise you though, it won't be the only thing I post on this blog. I love experimenting with all kinds of cuisines, specially the ones that we don't find easily in this part of the world. So please bear with me while I share my love for Goan food on this blog from time to time. One such recipe is a cabbage stir fry preparation. Its one of the simplest ways to cook a vegetable, I tell you. With a few basic ingredients, unlike most Indian food that calls for a long list of ingredients, this is a mildly flavored vegetable dish that many will like. Heat the oil in a vessel. Add the asafoetida and mustard seeds and let them sputter on a medium flame. Be careful not to burn them. Add the curry leaves and the green chillies and let them release their flavors. Add the chopped onion and sauté till the onions have become translucent. Add the turmeric powder and stir well. Tip in the cabbage and stir well to let the spices evenly coat the vegetable. Add salt to taste. Add a small splash of water. Cover and cook till the water has almost dried up. Check to see if cabbage is done to your liking, if you like it cooked more, add some more water, cover and cook. When the water has almost dried up add the coconut and stir through. Cover and let it continue cooking for a couple of minutes. Turn off the flame. Serve hot with some warm chapatis. Karishma, this is a base recipe for us too! Goa and Kerala, I know, but WB - what do u reckon is the similarity we share with them? Delicious and simple side dish. so simple and wonderful dish !! We love cabbage and your recipe looks so delicious. We will sure have to give it a try. Thank you so much for sharing with Full Plate Thursday and hope to see you next week! Have a great week end! Thanks everyone ... glad you liked it!!! Pancakes for the Breakfast Club!